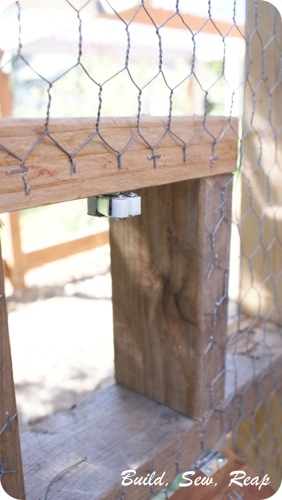 Now that we've gotten to know the chickens a little better and they've definitely grown to expect treats from us every time we walk out the door, they've gotten a little bolder and tend to rush the chicken yard door when we try to step in to deliver those treats. We have let them wander the back yard a few times but I'm not quite ready to let them out every time we visit them so I added a little door inside the door so we can easily toss treats into their yard for them. It is hinged at the bottom and then I put a little clasp at the top so the door won't drop open unexpectedly. 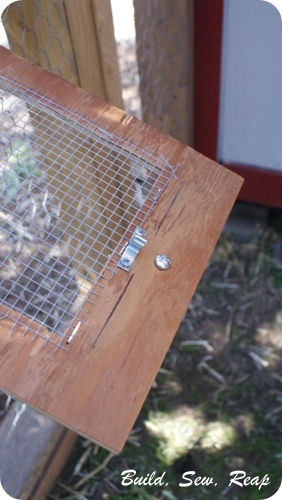 I'm hoping that small animals won't figure out how to open it too although it is pretty close to our house so I don't think there's much of a danger during the day and the girls get locked in their coop at night. We also don't toss them more treats than they can eat within about 5 minutes so there isn't old food to attract rodents into their yard. 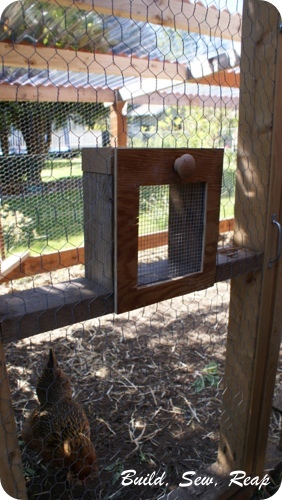 I would have liked to put chicken wire inside the little window but I didn't keep any scraps that small and I gave the larger pieces to a friend for a gardening project. The hardware cloth will do the job just fine.